Most aspects of our lives - our environment, relationships, work - require some form of energetic input, and give us some form of energy back. We rarely measure where our energy is being spent or coming from, we're much more likely to track our time or finances. I'm currently in London, a city which is both incredibly stimulating and physically draining. When I'm here, I tend to over-plan my days, spend a hell of a lot of time on buses (eating a hurried sandwich for lunch), and I get so wired it's hard to fall asleep. In Barcelona I tend to forget to factor in how slowly I walk in the heat. In order to have enough energy for our lives and work, it's worth keeping an eye on what's coming in and going out, and adjusting accordingly. It's not always obvious or static; you might feel energised by your day job and drained by your own creative work, or have a best friend in crisis but an acquaintance training to be a masseuse who needs volunteers. Planning your time according to what helps you stay balanced might feel like an indulgence, but it's actually a great way to be more effective and increase your stamina. The quality of the time you spend on each aspect of your life will increase when you balance your energy levels because you're no longer doing too much/ too little/ soldiering on when tired or wishing you'd planned things differently. Try drawing a picture of the energy the key aspects of your life give or take - relationships, work, your environment, hobbies. For the purposes of this exercise 'energy' is neither positive or negative. You can think of it in the scientific sense, the same way food is measured in kilojoules or watts in a lightbulb. 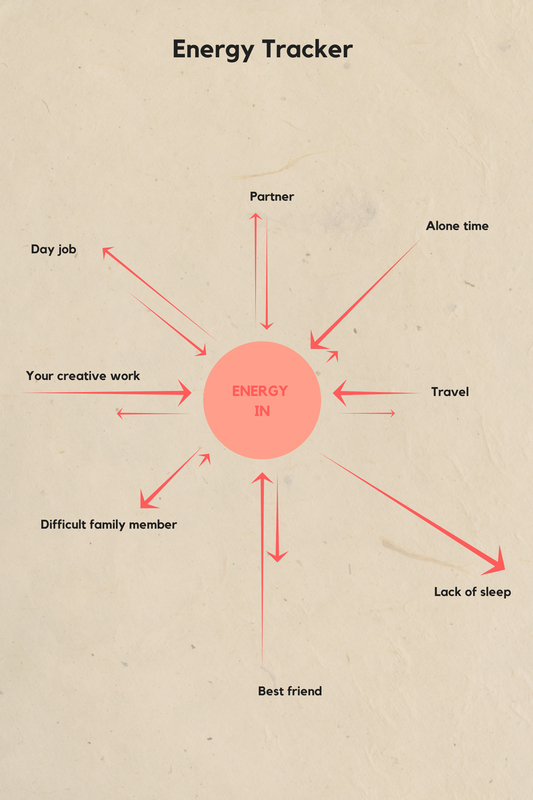 The arrows pointing inwards will indicate how much energy that person/activity gives you. The arrows pointing outwards indicate how much energy that person/ activity requires or takes out of you. The longer the arrow the greater the amount of energy in or out. Is there anything you need to do more or less of? What gives you the most energy and takes the most from you? (Swimming in turquoise water gives me the most energy, too much exposure to negativity on social media takes it away).